I was really impressed with the crew of Bravo’s new show Fab 40. 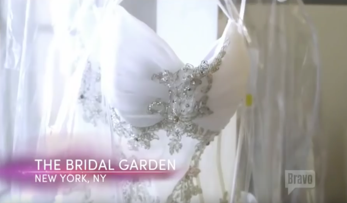 Fifteen of the coolest creative people descended on The Bridal Garden and went into action to film a segment of the show!To hear about The Bridal Garden, how it works and who it benefits watch for the upcoming show on Bravo. President and Founder of The Bridal Garden: Geraldine Brower. The Bridal Garden featured on Bravo TV. Notoya, Star of the reality TV show getting ready to try on a wedding gown. She even mentioned in the episode why she loves The Bridal Garden. Our consultant is hands on and ready to assist any bride that comes into The Bridal Garden find the perfect wedding gown! In this clip, Notoya tries on one of our Oscar De La Renta gowns. During the episode Sandra, Notoya’s mom steps in to provide support and words of encouragement.